Monophobia was formed by Philip Quinton and Bryn Rosenwould, two drunken media students who met in Watford in 1991, and had nothing in common, not even music. Phil couldn't play an instrument and neither of them could sing. The duo parted company in 1994 having made several juvenile, semi-musical college recordings and Monophobia was silent until 1997 when Phil met Tony Longworth, a songwriter from Shepherd's Bush with a nameless band and a handful of very cool tunes. They rehearsed/wrote/recorded infrequently between long stints in other bands until Tony became Monophobia's full-time frontman in 2000, giving Phil's struggling bedroom project the vibe it needed to work as a decent live indie band. Many other musicians and songwriters joined and left during the group's last few years, contributing to an eclectic range of tracks varying in style and quality. 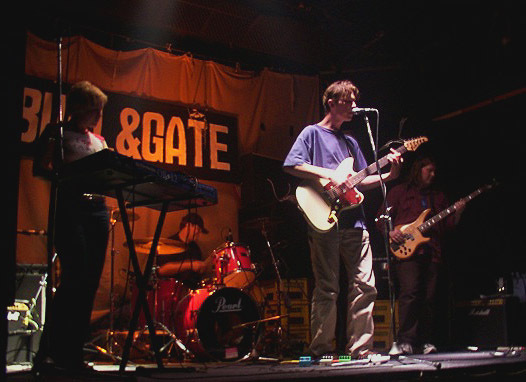 The band's activities peaked during the spring of 2002 culminating in a high point that summer with the recording of the excellent Wasted / Inside EP and the first real sales of earlier EPs to live audiences and internet shoppers. However Monophobia started to fragment during the autumn as key musicians left the band to do other things. Whilst pressure was on to get the new EPs packaged and distributed to A&R offices before the Christmas rush, the remaining bandmembers were split over what direction the band should now be taking as they struggled to break in new musicians, and the band fizzled out by 2003. In 2008 Tony, Nimesh, Phil and Dave came together for a one-off comeback gig in Camden Town, north London where Tony and Phil had first met 11 years earlier. Tony, Phil and Dave still occasionally write and record together at Phil's studio in Aylesbury where Phil is now working on a free-for-all collaborative solo studio project under the names Mr Dogbolter and (more selectively) Cold Steel Blizzard.